The measures are part of a wider effort by U.S. President Donald Trump to curb Tehran’s missile and nuclear programs and diminish the Islamic Republic’s destabilizing influence in the Middle East. 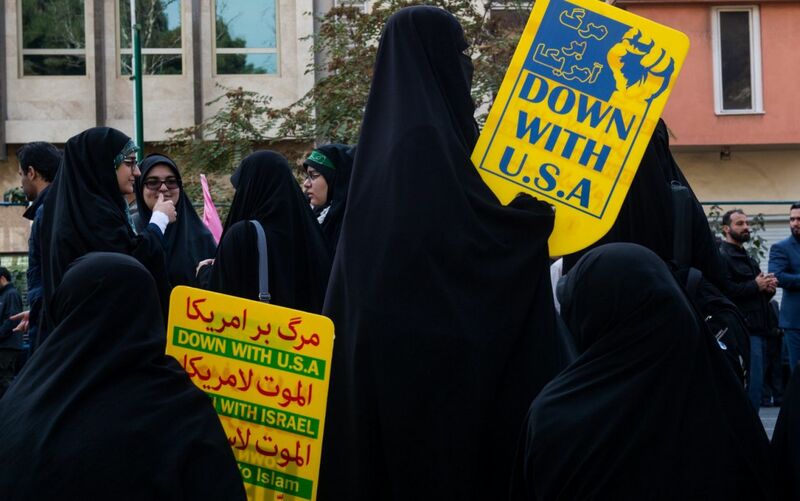 “Our ultimate aim is to compel Iran to permanently abandon its well-documented outlaw activities and behave as a normal country, or it can see its economy crumble,” Secretary of State Mike Pompeo told reporters. The sanctions are “aimed at depriving the regime of the revenues that it uses to spread death and destruction around the world,” Pompeo said. The move restores, and strengthens, sanctions lifted following President Obama’s 2015 Iran nuke deal, from which the Trump administration withdrew in May. [President Obama’s 2015 deal with Iran required the government to limit enrichment of uranium – which can be used for nuclear fuel or for building nuclear weapons. In exchange, most international sanctions against Iran, which were greatly hurting the Iranian economy, were removed. The move intensifies a campaign by President Trump to force Iran to further limit its program to build nuclear weapons and halt a missile program, as well as end its support for proxy rebel and/or terrorist forces in Yemen, Syria, Lebanon and other parts of the Middle East. ….. In Jerusalem, Israeli Prime Minister Benjamin Netanyahu hailed what he called Trump’s courageous decision in reimposing the sanctions on Iran, an arch-foe of Israel. …..
[President Obama and the leaders of Russia, China, Germany, Britain and France (the other signatories to the 2015 nuclear pact), claimed it was the best way to prevent Iran from developing nuclear bomb capability. Iran has repeatedly claimed its ballistic missile program has nothing to do with its nuclear weapons and is non-negotiable. “sunset” clauses under which key limits on the Iranian nuclear programme will start to expire after 10 years. Published at Reuters on November 5. Reprinted here for educational purposes only. May not be reproduced on other websites without permission from Thomson Reuters. b) What is the aim of the sanctions? What does the U.S. want Iran to do? Be specific. c) President Obama and the leaders of Russia, China, Germany, Britain and France (the other signatories to the 2015 nuke deal), claimed ending sanctions was the best way to prevent Iran from developing nuclear bomb capability. Iran has repeatedly claimed its ballistic missile program has nothing to do with its nuclear weapons and is non-negotiable. An Iranian official said Tehran was not concerned about the sanctions and will not change its policies. Most news reports focus on “European powers [and China] which continue to back the nuclear deal said they opposed the reapplication of sanctions.” Watch the videos under “Resources.” How do Secretary Pompeo’s comments on this differ from what is mostly reported? d) Ask a parent AND a grandparent: Do you support or oppose the Trump administration move to reinstate sanctions on Iran to force the regime to end its nuclear weapons pursuit? Please explain your answer.